Shugen Roshi will visit the Temple this week, staying from Thursday evening zazen through the Sunday program. During the the week, Roshi will offer dokusan, lead the Precepts Mondo on Thursday and the Zazenkai on Saturday, and offer Sunday's talk. (Please note that there will not be regularly scheduled morning or evening zazen on Saturday.) Hokyu will be here this week as staff person. Also this week, the What is Whiteness? Anti-Oppression group will meet on Sunday afternoon. Please see below for more information about upcoming programs. Precepts Mondo: On Thursday, February 7th, 7-8pm, Shugen Roshi will offer a mondo on the Buddhist precepts. The moral and ethical teachings of the Buddha touch every area of our lives. The extent to which these principles permeate our relationships and actions is enhanced by our understanding of them. This series of Q&A-style monthly mondos features MRO teachers facilitating open discussion about the Ten Grave Precepts as they relate to Zen practice. Zazenkai: On Saturday, February 9th, Shugen Roshi will lead a Zazenkai from 8am-6pm. This full day of extended sitting includes oryoki lunch, a talk, and dokusan with Roshi. Please note that registration for this Zazenkai is full. To be added to the waiting list, please contact the training staff at 718-875-8229 or zcnyc@mro.org. What is Whiteness? Anti-Oppression Group: On Sunday, February, 10th, the What is Whiteness? Group will meet from 1-2:30pm. This group is an opportunity for those who identify as white to take responsibility for racism by looking deeply at our own conditioned biases and assumptions. We use the skills learned in our Zen practice to work with the feelings that arise, and engage in readings and deep listening, supporting each other in this process. Theatre of the Oppressed Workshop: Coming up on Saturday, February 23rd, 2-4pm, Theatre of the Oppressed NYC (TONYC) will visit the Temple to present a workshop in which theatrical problem solving merges with transformative action in interactive plays inspired by real-life struggles. To find out more, visit the TONYC website. Spring Ango Opening: Coming up on Sunday, March 10th, Spring Ango will begin at Fire Lotus Temple with an opening talk by Hogen Sensei during the Sunday program. Following the Sunday program, everyone is invited to stay for lunch and to participate in a forum presented by the MRO's Beyond Fear of Differences planning group. Spring Ango is the MRO's March-May period of intensive training. A full schedule of Ango retreats and other programs will offered at the Temple, starting with a four-day Temple Sesshin, March 7-10. These programs are open to all, including those not formally participating in Ango. For more information about Ango training, see the MRO's Ango website, or contact the Temple training staff. Temple Residence Opportunities Available: The Temple will have openings in March for new short or long term residents. 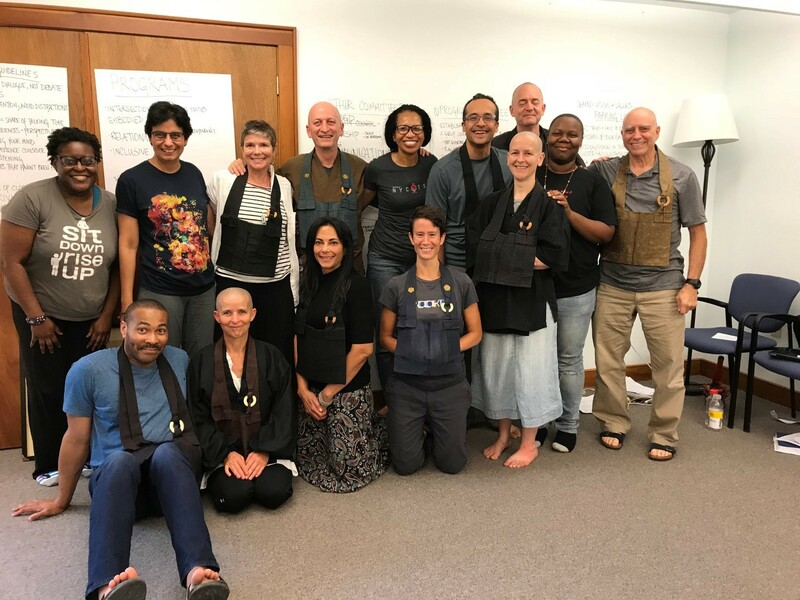 The residency program is designed to support lay practitioners living in a spiritual community and engaging in traditional Zen training, while maintaining outside work and other responsibilities. Residency is open to all practitioners, including MRO students and those who are not formal students. If you have questions or would like to apply for residency, please contact the training staff at 718-875-8229 or zcnyc@mro.org. Please label your student robe: If you keep your student robe at the Temple, please label it with your name. As the robe room and coat room have limited space, all student robes, oryoki bowls, and other personal items stored in these areas should be clearly identified. Pens are available at the Temple for labeling. Please note that after Sunday, February 24, unidentified items may be removed or made available for use by residents. Thank you! . The moral and ethical teachings of the Buddha touch every area of our lives. The extent to which these principles permeate our relationships and actions is enhanced by our understanding of them. This series of monthly question-and-answer mondos features MRO teachers facilitating open discussion about the Ten Grave Precepts as they relate to lay practice. A full-day silent zazen intensive. Participants will have an opportunity for dokusan with Roshi. Please note that registration for this Zazenkai is full. To be added to the waiting list, please contact the training staff at 718-875-8229 or zncyc@mro.org. This group is an opportunity for those who identify as white to take responsibility for racism by looking deeply at our own conditioned biases and assumptions. We use the skills learned in our Zen practice to work with the feelings that arise, and engage in readings and deep listening, supporting each other in this process.